What is Hydraulic Fracturing - Fracking? Unlike vertical drilling which has taken place for several decades, Horizontal Hydraulic Fracturing "Fracking" is a relatively new process used by the gas industry to extract natural gas from the Marcellus Shale. The Marcellus Shale is a 600 mile long rock formation that stretches from West Virginia to western New York. The horizontal hydraulic fracking process involves mixing dangerous cancer causing chemicals with enormous amounts of water and sand, which is injected into the wells at extremely high pressure in order to break up the rock layer and release the natural gas from thousands of feet below the earth's surface. There are 5 dangerous stages of the hydraulic fracturing process and the most dangerous stage is the disposal of the toxic brine wastewater. Some states such as Vermont, New York, Maryland... and hundreds of cities and counties, have either a moratorium or a Ban on Fracking for several reasons, including the simple fact, that: for as long as there are cold hearted self serving people in this world who don't follow regulations and don't enforce regulations, fracking poses an incredible threat to the environment and human health. Sacrificing Health for Big Profits and Big Political Contributions? It's no secret that the natural gas industry makes billions in profits each year and spends a fortune on lobbying and huge political contributions which buys them a lot of huge political favors. In addition, they spend millions each year on expensive ads and commercials trying to convince the public that hydraulic fracturing for natural gas is conventional and safe, but there is nothing conventional and safe about it, especially in West Virginia, where state regulations are ridiculously lax and are NOT ENFORCED. The WVDEP allows Danny Webb, who has a long history of violations, to collect his own water samples to test the head waters of Wolfe Creek for fracking chemicals. Most people believe that is equivalent to letting a drunk driver take their own DUI test! A recent report released by the Natural Resources Defense Council (NRDC) shows that contaminated fracking wastewater is threatening people's health and the environment, and that none of the methods currently being used to treat or dispose of wastewater are safe enough. Some Lochgelly residents believe that the sediments pits have been leaking into Wolfe Creek for the past several years. They have repeatedly expressed concerns to the WVDEP - OOG about the ongoing air and water pollution over the past several years, and believe the reason the frack dump has not been shut down is because the WVDEP benefits financially from it. 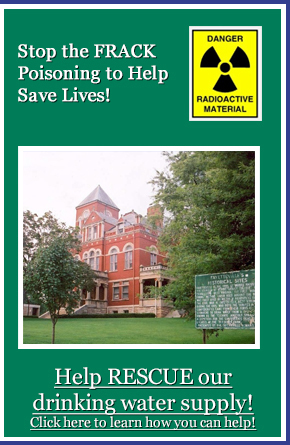 Click here to learn how you can help stop the poisoning of Fayette County. 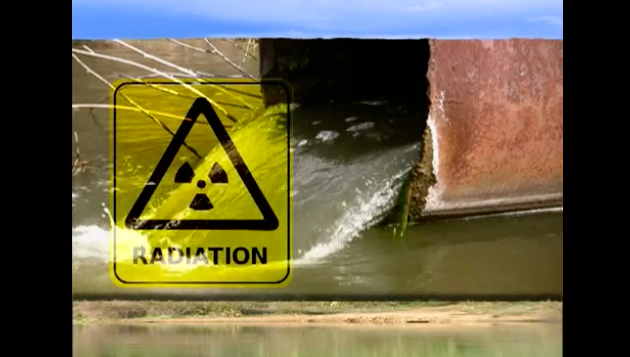 Click here to read articles about the Dangers of Fracking Wastewater.